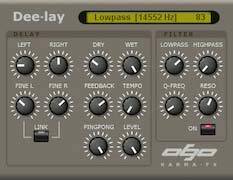 KarmaFX	Synth Modular is an advanced and highly	flexible Simulated Analog Modular Synthesizer and Effect Unit. Its amazing visual- and	highly intuitive user interface	lets you modulate just about any knob or slider	by any control signal -	making the soundscape possibilities almost endless. The internal high-frequency digital simulation of analog voltage levels produces a sound quality that	rivals even expensive hardware synthesizers. A comprehensive	User's Manual and tons of bundled patches make it easy	to get started producing your own unique sounds. Check out the sound demos, view the full specifications and try out the demo below. The Demo version	is free	for 30 days trial use. It times-out	and has	limited	save and update	capabilities. The Full Registered version never times-out + Comes with extra patches, more skins and a User's manual. Buy KarmaFX Synth Now ! Advanced Simulated Analog Modular Synthesizer and Effect Unit. Full Modular patching of synth Components and Controls. Internal high-frequency digital simulation of analog voltage levels. Oscillator with phase, Detune and Pulsewidth that generates	standard synth waveforms. Dual Oscillator with Detune, Hardsync and Ring modulation. 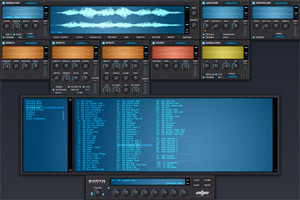 Sampler, 16/24/32 bit Mono/Stereo multi sample player that imports WAV/SF2/SFZ files. Multisample	editing	with Key/Velocity-ranges and Loop-Points. Additive and Pad module with waveform and Harmonic Magnitude/Phase editors. 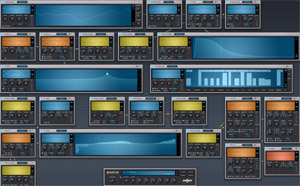 User defined waveforms and built-in	presets	of up to 1024 harmonics. Additive Module Phase Offset for improved transient control. SVF, Zolzer, Moog, 303like,	MS20, Formant, Comb, Allpass, Parametric and Shelving	Filters. 10-band digital and	31-band	simulated analog Graphic Equalizers. EQ3, 3 band equalizer with adjustable crossover frequencies, and 2 and 4 pole modes. Amplifier and Stereo module	with Panning, Volume and Velocity control. Two	channel	Mixer with Ring	modulation and Circuit Bending Bit Shuffle operations. Delay, Reverb, Phaser, Chorus/Flange, Pitchshift, BitShuffler and Distortion effects. Soft-knee Compressor with Peak/RMS detection and optional Sidechain. 10 Octave/12 Note Pitch control with Detune, Portamento and	Pitchbend support. Controllers	for Frequency Modulation (FM) and fast frequency sweeps. Up to 16 channel Unison controller with Detune and Stereo pan spread. 32 step, 4 octave Pattern controller with Hold, Loop, Legato and Arpeggiator. Custom arpeggiator note masking with 31+ scale presets. Bipolar/Unipolar LFO with Tempo Sync, HFO with FM/Phase Modulation option. ADSR and Multipoint Envelopes with Linear, Exponential, Hermite and Cubic curves. Step Sequencer, Envelope follower, Sample &	Hold and Decay modules. Output module with Panning,	DC removal, Volume and Clip control. Noise generator, filtered Pink, White and Brown Noise with Frequency Sync control. PanSpread stereo expander with individual low and high spread + crossover frequency adjustment. Sonic Maximizer emulation module with Low Contour, Process and Peak Detector. Input generator so synth can function as an	Insert effect. Full stereo	support	(selected modules can run in mono to save CPU cycles). Patches are	built up of Generators,	Filters, Amplifiers, Controllers, Effects and Modulators. Up to 97 simultaneously running modules (16 modules per group and 1 output module). Instant visual feedback on all controls. Frequency,	Time/Amplitude,	Modulation, etc. Fully customizable GUI resolution of up to 4096 x 2048 (default is 1024 x 768). Customizable GUI patch-cables can be shown as linear, curved and dangling. Optionally see knobs and sliders animate as they are modulated. Choose between Mono, Legato, or up to 16-voice true	Polyphony. Fast trigger and output response, with zero latency and zero latency compensation. Up to 128 simultaneously running internal voices (Polyphonic and Unison combined). MIDI modulator modules for MIDI Controller,	Velocity, Aftertouch and Pitchbend input. 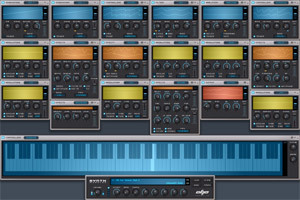 128	user-assignable	Automation controls with MIDI Learn. Fully skinnable GUI: Optional skins	are bundled with the installation. 7 banks of pre-made	KarmaFX patches	+ userbanks. (More than 1300+ patches total). KarmaFX	Plugin Pack is a collection of quality effect plugins that are small, simple and easy to use. Plugins	that simply get	the job	done without too much knob tweaking. The pack includes a simple filter plugin, a tempo controlled delay, a 31 band graphic equalizer, a reverb and a User's manual. It is only available for PC/Windows in 32 bit. Download and view the full specifications below. Download KarmaFX Plugin Pack ! Make a Donation to KarmaFX ! One Two	Pole Multimode Filter (-12dB/oct). Adjustable	frequency, resonance (Q) and saturation	drive. Selection of Lowpass, Highpass, Bandpass or Bandstop output. Two One	Pole filters (LP, HP, -6dB/oct) with adjustable frequency. Filter series: In -> Two pole -> One pole -> One pole -> Out. Filters can be turned on or off (bypassed). Coarse delay (0-16	beats/4) and fine delay	(1 beat/4) adjustment. Up	to 4 second delay time (per channel) at	96kHz (8s at 48kHz). Adjustable	cross delay feedback mixer (pingpong). Resonance with adjustable freq and	Q.
DC	block in feedback (-3dB	at 30Hz). Fixed center frequencies ranging from 20Hz	to 20kHz. Accurate analog simulation	of Boost and Cut EQ filters. Fully symmetrical (reciprocal) filter response. 6,	12 and 24 dB boost/cut for gentle, medium and harsh equalization. Boost option for extreme 36 to 96 dB equalization. Low (20Hz-1kHz), Mid (1-5kHz), High (5-20kHz) or Full equalization. Optional low and high shelving. Adjustable	overall	mix and	gain control. Reset button and keyboard shortcuts for easy editing. Up	to 10 seconds of reverberation time (decay time). Up	to 500 ms Predelay with	adjustable synced feedback. Damping adjustment	controls internal (comb) filtering. Early reflections adjustment (modeled from	real impulse responses).